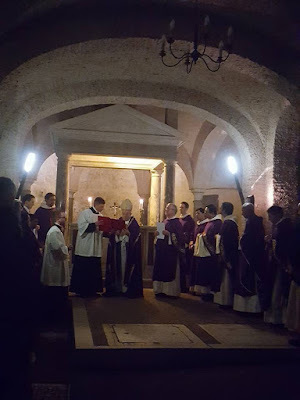 Over the last few years, quite a number of people have either written to me or left a note in one of the comboxes to say how much they enjoy this series, so I apologize for letting myself get behind with it during this very busy week. 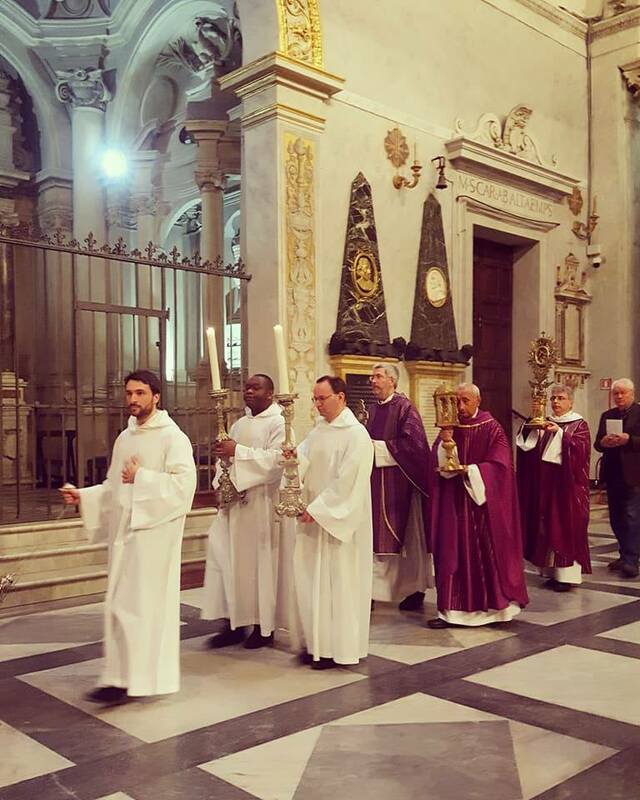 It has become kind of a tradition that every year we miss a station or two. Our Roman pilgrim friend Agnese was unwell on Ember Saturday, and so she missed the Station at St Peter’s that day; the station church for the Second Sunday of Lent, Santa Maria in Domnica, is currently closed for restoration, and the stational Mass was therefore celebrated in the unattractive chapel of a nearby hospital. We therefore resume with this post covering Monday to Friday of the Second Week of Lent; the next one will go from yesterday to next Wednesday. 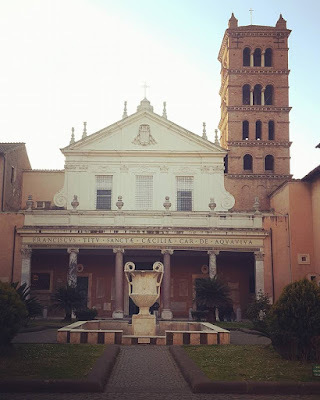 San Clemente is famously built on three levels; the 12th-century church seen below in pictures 3-5 was built on the ruins of the original basilica from the 4th century, which in turn sits on top of two ancient Roman buildings, one of the late first and another of the mid-2nd century. 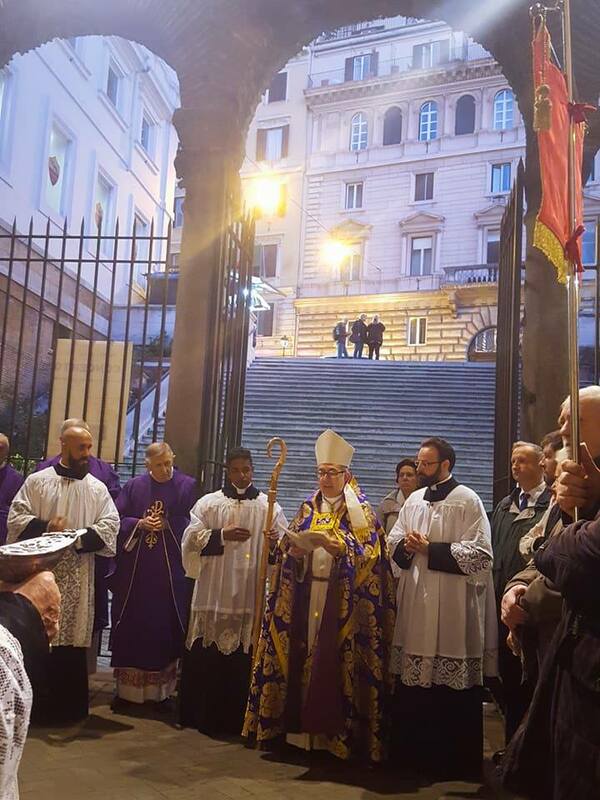 All three of these levels are accessible to the public. When the second level, the church of the 4th century, was dug out in the middle of the 19th century, no remains of an altar or any part of the sanctuary were found . The archeologists soon realized that in the process of building the newer church on top of the older, the 12th-century builders had dismantled them entirely, moved them upstairs, and reassembled them in their current place. 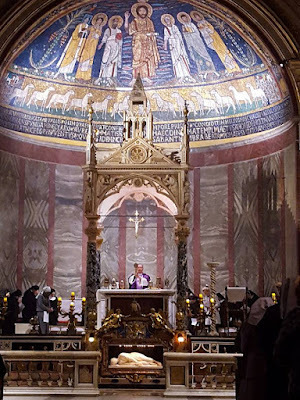 The altar and baldachin seen here were then newly made so that the newly rediscovered spaces of the older church could be used once again for worship. 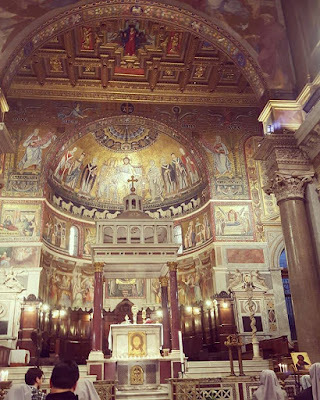 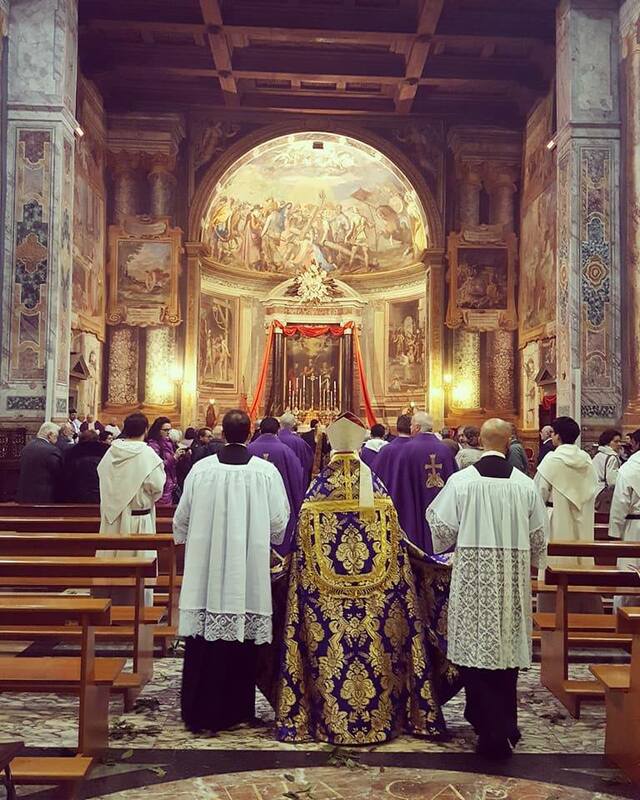 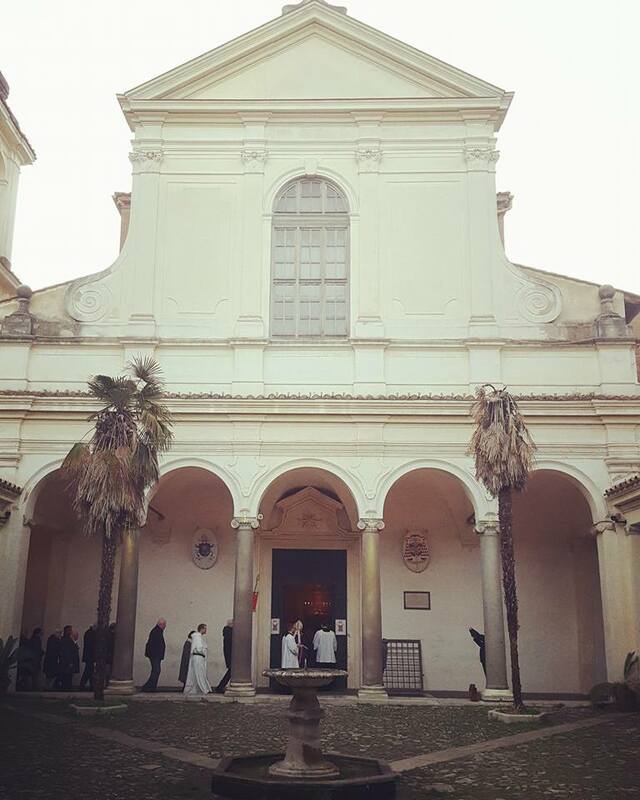 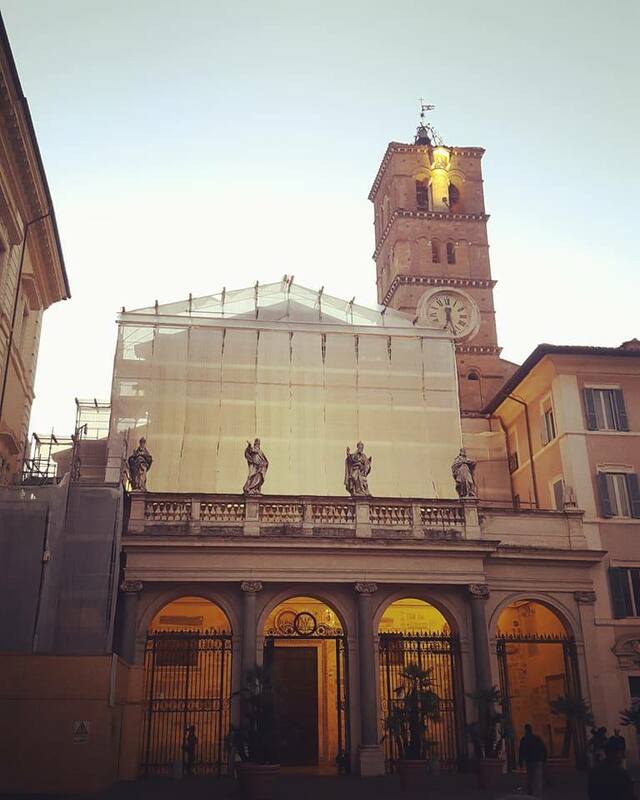 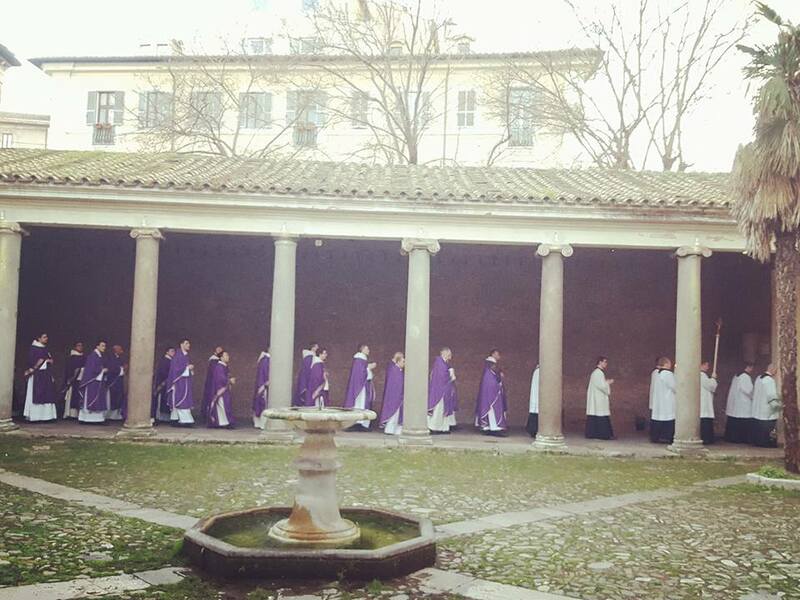 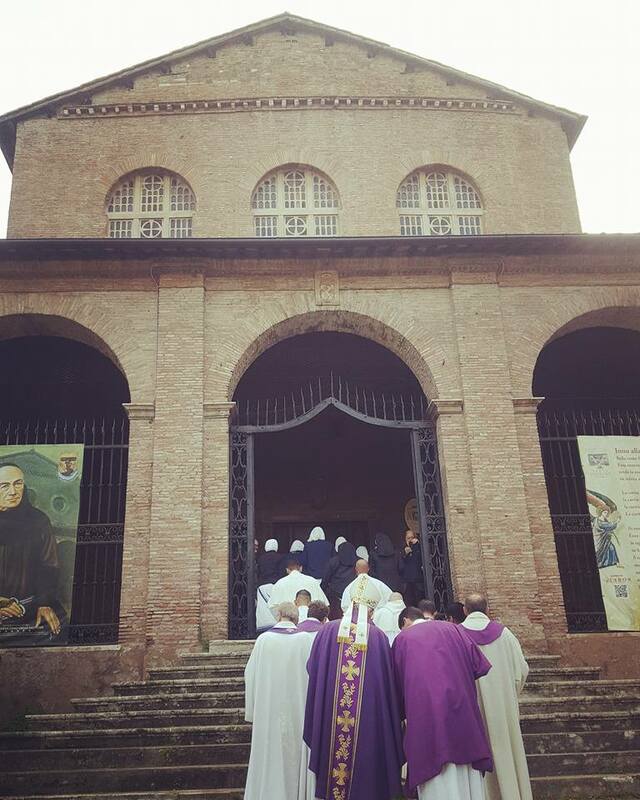 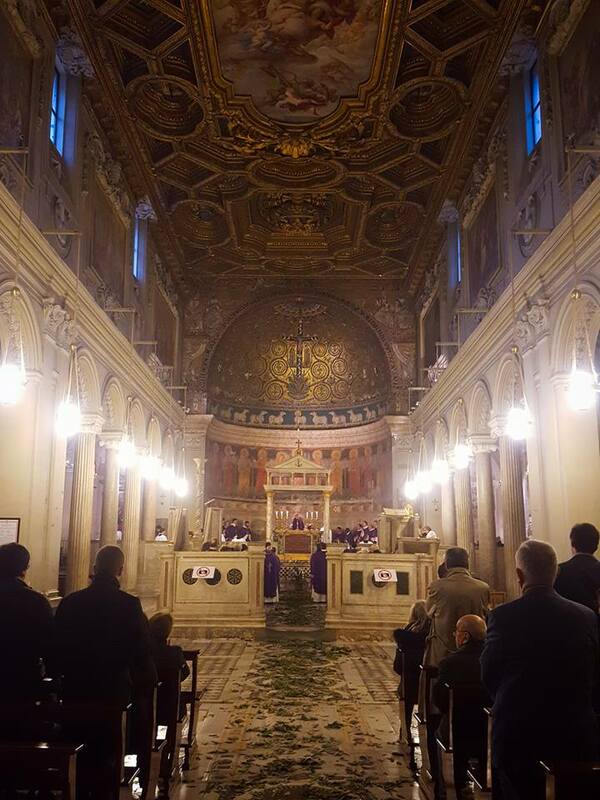 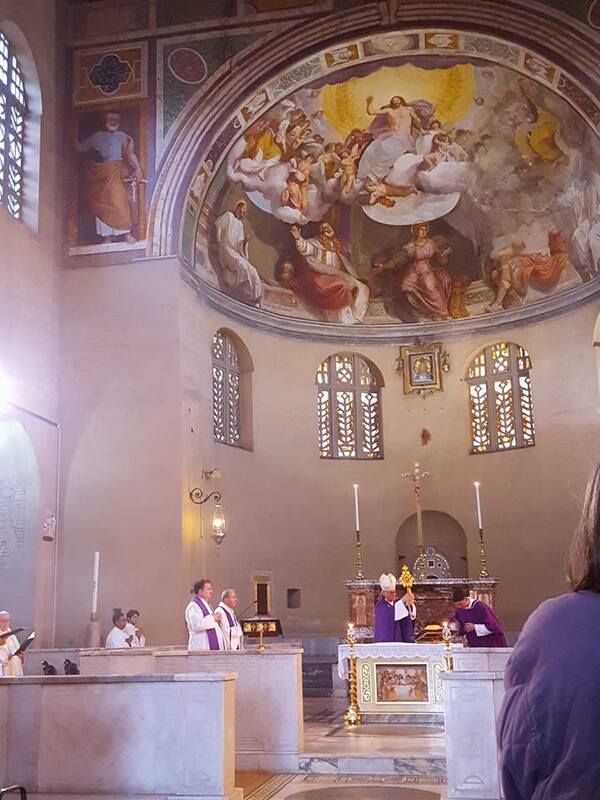 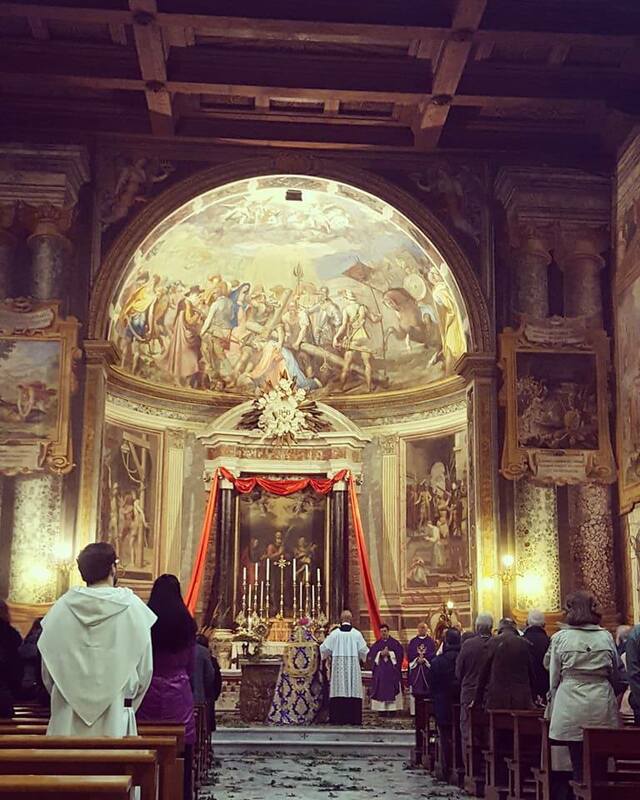 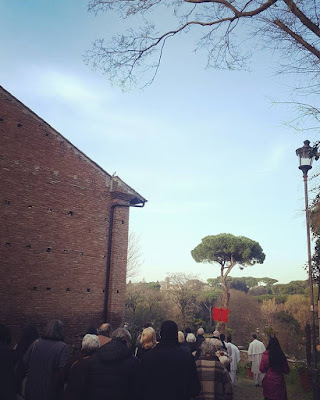 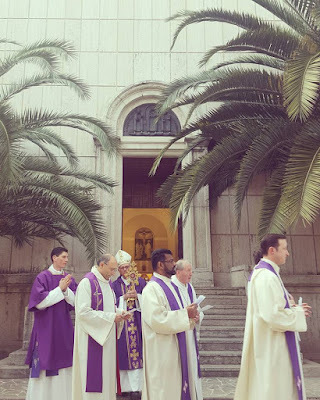 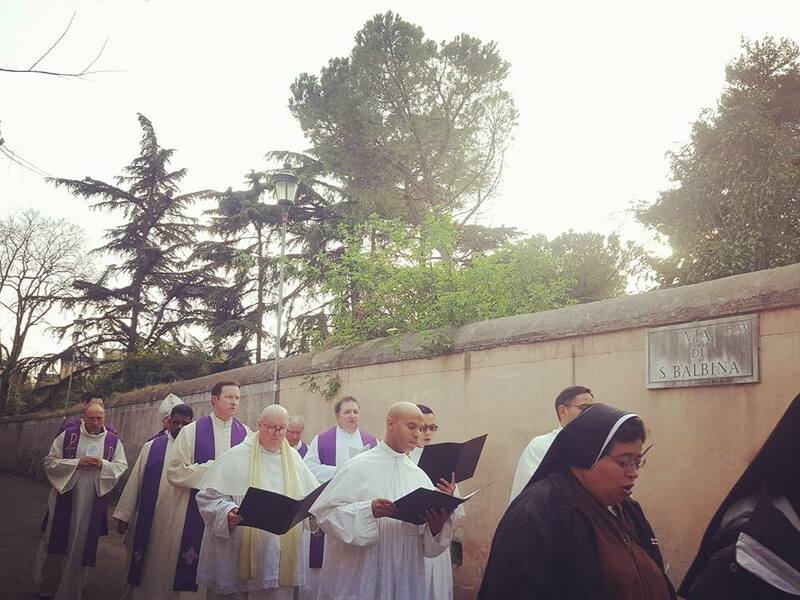 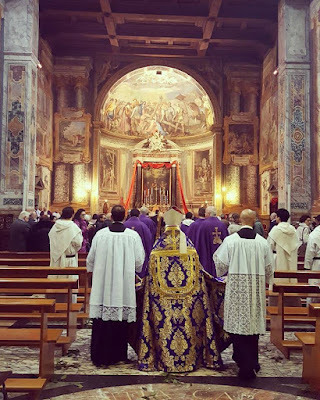 The church of Saint Balbina on the Aventine Hill is very close to the Norbertine College, and each year, members of the latter participate in the stational procession, while the college’s choir sings the liturgy. 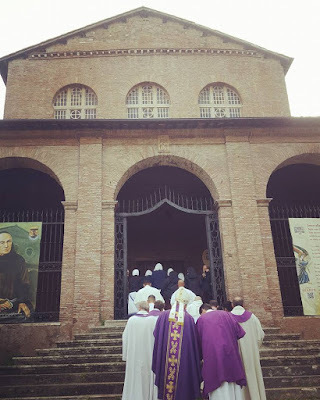 The second photograph shows members of the clergy before the main door of the college, followed by the procession though the rather narrow streets on the way to Santa Balbina. 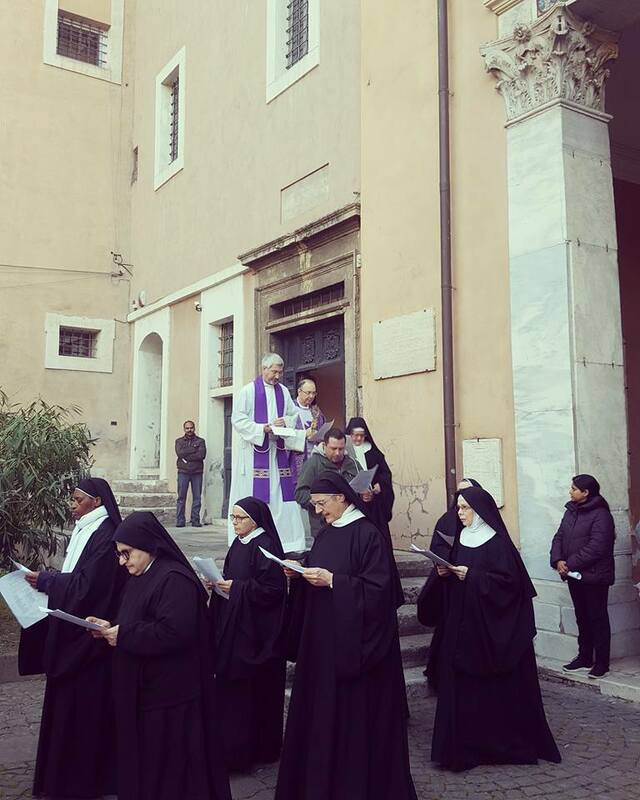 The church is home to a community of Benedictine nuns. In front of the altar is the famous statue of St Cecilia by Stefano Maderno, depicting her as her body was said to have been found when her tomb was opened in 1599. 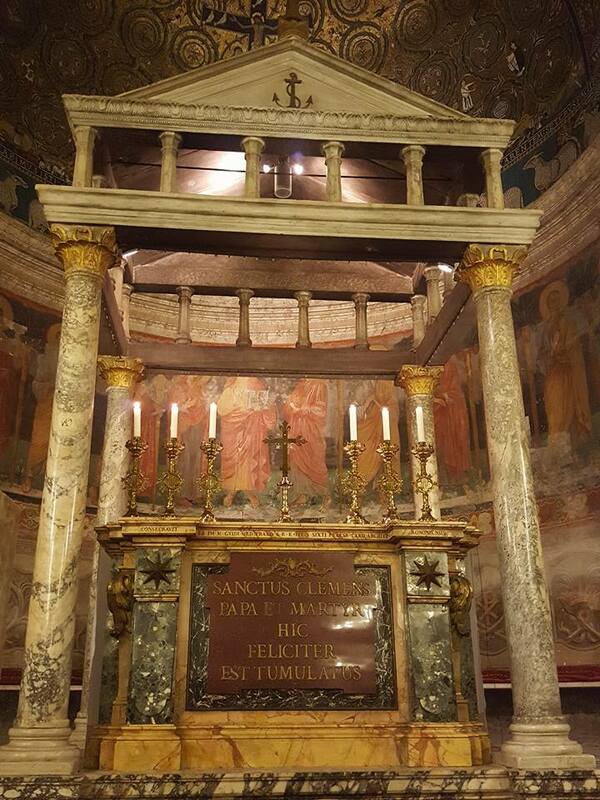 The relic seen at right is of the Holy Cross; the round reliquary next to it in the photo is of Pope St Callixtus I (ca. 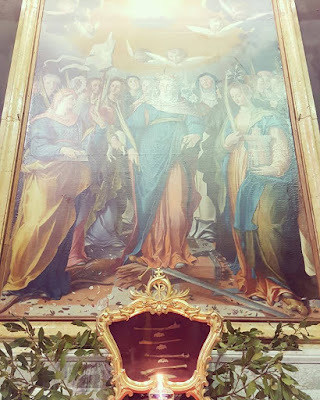 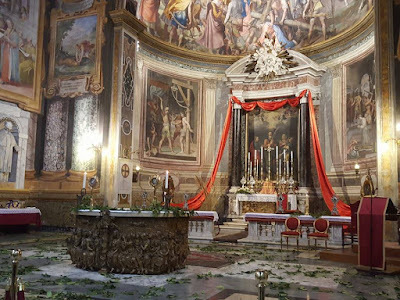 218-223), whose traditional legend states that he founded a church on the site where Santa Maria in Trastevere is now, and was martyred nearby by being thrown into a well. 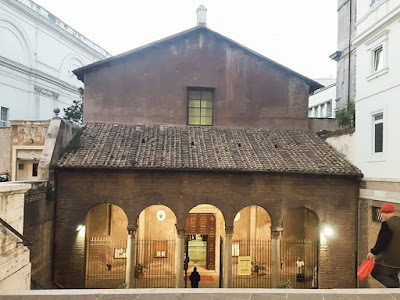 The church of San Vitale was first dedicated in the year 416; modern constructions around it, including the street on which it sits, the via Nazionale, are on a much higher level, and one must now descend a rather large staircase to reach the church, as seen here.